BlackBerry Q10 comes with a fabulous 8Megapixel primary camera with 5x digital zoom and the ability to record 1080 x 1920 HD video. There’s also a nifty little 2Megapixel front facing secondary camera for all those important video calls over Wi-Fi and 3G. The 3.1-inch super AMOLED multi-touch capacitive touch screen renders images in a myriad of 16 million colors for a captivating viewing experience. 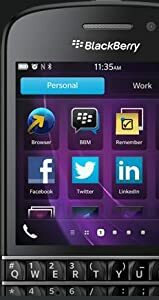 This BlackBerry phone sports an electrifying 1.5GHz dual core processor and an impressive 2GB RAM with 16GB internal memory which is expandable up to 32GB with micro SD Cards. Even if your phone is lost or stolen, you can now protect your data with in-built BlackBerry Protect. This feature allows one to lock or even wipe data from their phone so that the content remains private and safe. It also has a smartly designed balance technology, which allows you to keep your information secure and separate by creating two profiles- one for work and other for personal use. You can use the new Screen Share feature in the phone to view photos or take a quick look at a business document at the same time. It is meticulously crafted by its manufacturers to provide quality performance. 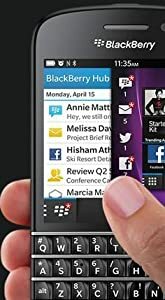 Regale in the slick new BlackBerry 10 operating system, the range of great apps and features works well together and seamless, uninterrupted experience on the information highway. It also displays crystal clear images and possesses ergonomically sculpted keypad. This classic keypad has been re-engineered to ensure effortless typing experience for its users. With NFC technology exchanging data is made easier and faster than ever before. Buy the new BlackBerry phone to be in constant contact with all your messages and conversational histories. With Blackberry Hub, you can easily slide in and out of the premier portal easily. The voice control feature installed in it helps you to talk and type with ease which automatically separates natural speech from the noise. You can now read a document, compose e-mails or search items on your smart phone hassle free. The 2100mAH battery provides an impressive 13 hour talk-time and a mammoth 355 hour standby time of on 3G networks. Access your work email and apps on your BlackBerry Q10 smartphone, without compromising your personal experience and use. BlackBerry Balance technology keeps your information secure by creating two profiles, one for work and another for personal use. Managing a busy project? Planning your next holiday? Collect relevant photos, lists, messages and web links, and group them all in one place. Stay close to what's important to you without stopping what you’re doing. 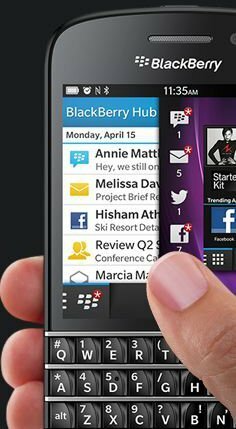 Simply peek into the BlackBerry Hub from any app with just a swipe and flow effortlessly in and out of your messages and conversations. Switch your BBM chat to a BBM Video conversation and see the smiles of those that matter to you most. Use the new Screen Share feature to show photos or your browser, or review a business document together. You can even share the view from your camera. The BlackBerry World storefront now gives you access to more of what you love. Download apps, games, music, videos, books, magazines and more. Plus, the new BlackBerry World gives you recommendations so it's easy to find something new.